BYRNE LOOBY PARTNERS, an Irish-headquartered international consulting engineering practice, has announced it is to create 25 new jobs at its Irish offices. Overall, the company is creating 50 new jobs in Ireland and internationally, but 25 of the jobs will go to their offices in Dublin, Cork Galway and Belfast, with support from Enterprise Ireland. A further 25 roles will be filled at the company’s seven international offices in the UK, North Africa and the Middle East. This year, the company acquired PH McCarthy, Ireland’s longest established consultancy, and has rebranded its water and infrastructure service division. Byrne Looby Partners’ project list includes the Aviva Stadium, The Shard, the STEP Sewer – a 40 kilometre wastewater tunnel in Abu Dhabi, Heathrow Terminal 2, and Swords Waste Water Treatment Plant. The company works with BAM, Sisk and a range of local authorities across the country. 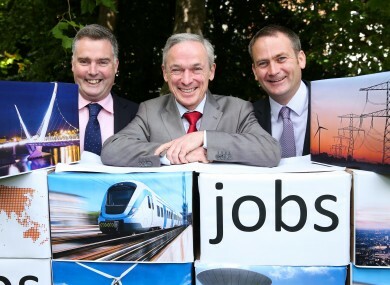 Minister for Jobs, Enterprise and Innovation, Richard Bruton welcomed the jobs announcement, while Joint Managing Director, Michael Looby said the company has commenced recruitment and is aiming to fill all positions over the next 18 months. Roles include engineers, project managers and business development and support staff. We are actively looking for talented people that will help to continue to grow our business. We have expanded significantly over the past five years through a targeted international growth strategy and have put plans in place to progress this further. We look forward to hiring people who will continue our tradition of hard work and engineering innovation. Email “Consulting engineering practice creates 25 new jobs ”. Feedback on “Consulting engineering practice creates 25 new jobs ”.